On October 1st, iKON returned to the Kpop race with their song title “Goodbye Road” from their mini album New Kids: The Final. This is iKON‘s third comeback this year after the success of their previous two comeback hits, “Love Scenario” and “Killing Me”. The song “Goodbye Road” was written and composed by B.I and Bobby. According to fans’ comments, “Goodbye Road” is an ear-catching song with romantic, ballad-like melodies. Beside the high quality music, the boys’ images in the MV also received a positive response from the fans. Although iKON is in the “storm” caused by Jun Hoe‘s scandal, “Goodbye Road” still ranked high on many online music charts in Korea. Even so, the song also excelled at number one on iTunes in 25 countries and regions. At the same time, New Kids: The Final also took the top spot at the worldwide album chart on iTunes. 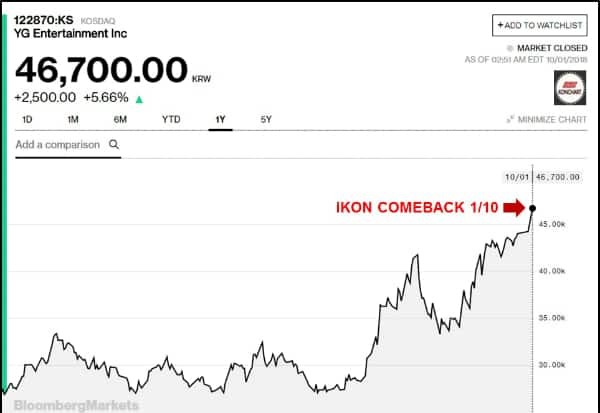 This time, iKON‘s comeback also positively influenced YG shares index. Since iKON has returned, the shares have shown a slight increase and rose to 5.6% yesterday. Specifically, after October 1st, YG shares reached 46,700 won, which is the highest value within a year. Fan commented, “That is why YG always favors iKON and let them have a comeback regularly”; “Currently no one but iKON can make more money for YG”; “iKON is always the top earner for YG, so if Yang CEO has a favor on the group a little bit, it’s understandable”. Currently, iKON‘s fans are actively stream “Goodbye Road” to help iKON soon achieve “All-Kill” certification. Results for the 8th Gaon Chart Music Awards: BlackPink, TWICE, iKON and BTS won big!